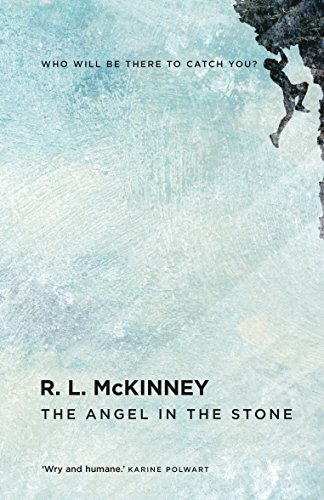 The Angel in the Stone is the second novel by RL McKinney following Blast Radius. You can read my review of that excellent book here. The Angel in the Stone is just as beautifully written. Three generations of a family tell the story in turns. Calum lives in a quiet part of the West Highlands and still finds it hard to come to terms with the death of his brother Finn in a climbing accident over 20 years before. His difficulty coping with this has led to estrangement from his daughter Catriona, from a previous relationship. Closer to home, his mother Mary is becoming more and more forgetful and suspicious of everything Calum does. When a clearly distressed Catriona arrives unexpectedly at the same time as Mary has had to move in, not only is Calum’s peaceful life disturbed, it seems it may finally be time for the whole family to face up to the past. Always in the background of the book is the shadowy figure of Finn and how his life and death continues to impact on his mother and brother. What impressed me with this novel was the way the author has captured so beautifully and convincingly the three different voices of her characters. It can’t be easy to find the voices of a troubled teenager, a middle-aged man and an elderly lady, especially when she has dementia. And yet RL McKinney has managed to give each one a distinctive voice and has done so with aplomb. Calum is truly one of the sandwich generation and it is a welcome change to see a man in this role in fiction. From someone who was pretty much just drifting along, circumstances force him to focus on his family and, like most people in his situation, he more than copes. Because really, what is the alternative? Young Catriona is running from a difficult situation at home and struggling to articulate how she is feeling to anyone. She and Calum haven’t had the easiest of relationships and it was really quite a risk heading off to see him. My heart went out to this character as she was trying so hard to cope with what happened. I was hoping that Calum would discover some fatherly instinct in himself to form a relationship with his daughter. They were both quite similar really in not wanting to talk to people and trying to keep everything inside. Mary’s story was the one I found most poignant though. Most people these days will have some experience of a family member with dementia and will recognise her behaviours. I felt that the author had captured perfectly the confusion, forgetfulness and suspicion of those with dementia as well as showing the moments of clarity. The worry caused for the rest of the family was also clear to see. The Angel in the Stone is a powerful story showing how the past comes with us into our the present day. It shows the importance of family, acceptance, communication and forgiveness. It is a very moving read and another unforgettable book from this author. Sounds a very ‘human’ read Joanne..if that makes sense!! A very good way to describe the book Mairead. Sounds great. Looking forward to this one after having loved Blast Radius.